Have you ever taken a selfie in your underwear and posted it online? It’s a concept that probably has you feeling pretty anxious! But thankfully for the vintage community there are ladies brave enough to do it and one of these is Elinor from The Nylon Swish. Not only is Elinor an absolute delight, she is also so knowledgeable about all things vintage underwear, corsets, stockings and foundations. 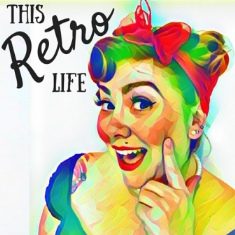 We were lucky enough to be able to tap into that knowledge on Episode 2 of This Retro Life. Hear how a man introduced Elinor to the ways of vintage underwear, the incredible rumours and comments she’s heard about what happens if you wear a corset and find out everything you need to start building your vintage foundation collection. https://www.whooshkaa.com/player/episode/id/89702?visual=true” target=”_blank”>Listen to Episode Two of This Retro Life to find out more. Oh and if you want to see Elinor wearing the best bullet bra you’ve ever seen then click here! You can find The Nylon Swish on all your favourite social media sites. And after years of trying vintage underwear from around the world, Elinor has just developed her own line of suspender belts that look amazing!